Portable solar cell with nickel cadmium battery. 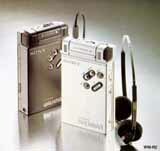 Can be used to power a Walkman, portable radio or cassetterecorder. The output voltage can be switch between 3V and 6V. no second hand price information available.